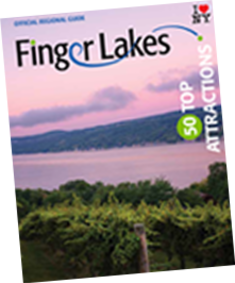 Tioga County is the Southern Gateway to the Finger Lakes, just below Ithaca, NY. You’ll get your fill of authentic, small-town charm here, but don’t let that fool you into thinking that you’ll have any lack of activities and adventures to fill your time. Quaint villages on scenic routes can be found throughout the county, along with some of the most beautiful natural landscapes and farmland in the region. The Village of Owego on the banks of the Susquehanna River is well-known for the abundance and variety of shops and eateries in its historic downtown. Stroll down the Owego Riverwalk and you might see a bald eagle soaring along the tree-line. Many restaurants offer outdoor dining and some are pet-friendly, including the Farmhouse Brewery, a tap room serving their own farm craft brews made with local ingredients and their own malt. Early Owego Antique Center, with over 90 vendors, is just one of the antique shops in the walkable downtown. The new Tioga County Visitor Center has a beautiful deck overlooking the river and invites all to take in the view! The Village of Waverly is a hidden gem just off I86. The main drag is lined with historic building housing shops with beads, antiques, vintage records and gifts. There are great places to eat and the Susquehanna River Archeological Society where you can learn about the Native American history of the region. One of the most beautiful parks in the region, Waverly Glen Park, is just a 5 minute car ride away. Waverly Glen Park has a waterfall, creek, playgrounds and pavilions and is the perfect place to relax in the shade of the glen. Sharing a border and trails with Waverly Glen Park is Two Rivers State Park, with trails for hiking, running, and biking. Tioga County’s history is rooted in agriculture, and farm stores, stands, and markets can be found throughout the county. Engelbert Farms in Nichols was the first certified Organic dairy farm in the United States. Pumpkin farms and a corn maze are popular fall destinations. At the Bement-Billing Farmstead, a living museum, you can travel back in time and see what life was like on a colonial farm with docents in period dress demonstrating blacksmithing, textiles, open-hearth cooking and more! There are many charming places to stay along the river, in downtown Owego, and throughout the county. From B&B’s to trusted chains, you will find the right accommodation for you. The new Hotel at Tioga Downs Casino Resort has access to the casino floor and restaurants, views of the harness-racing track, and a heated salt-water pool for guests. Tioga County welcomes visitors with open arms and friendly smiles. Whether you stroll through the villages, visit a museum, cruise the backroads, tour a farm, or roll the dice at the casino, you will enjoy your time here.